That’s what the sign taped to the Fossil Free Yale student group table in front of the entrance to Yale University President Peter Salovey’s office building read. 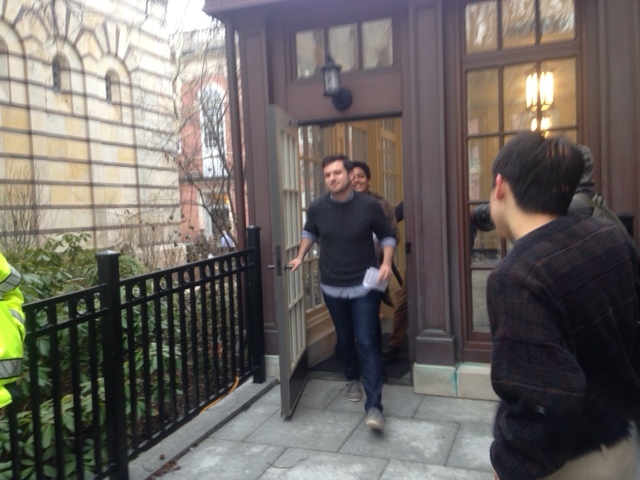 If you got to 105 Wall Street around 4:30 p.m., you were on the outside, where most of the Yale student activists-estimates had the numbers well over 100-were waiting for word on a sit-in that began at 8:45 a.m. when 48 members of Fossil Fuel Free Yale walked into Salovey’s office and asked him to reconsider the University’s position on investment in the fossil fuel industry. Yale security would later stop letting anybody else in. Nobody knows exactly how much money Yale has in fossil fuel, or what companies-although as of 2013, around 8 percent of its investments were under “natural resources”-but students have been urging the university to divest since 2013. The concern-echoed on college campuses across the country-is regarding not only the reported environmental impact of fossil fuel emissions, but industry exploitation of indigenous communities. “The people exploited by the industry are marginalized communities that do not have the same political, economic, and social power as others,” said Hannah Nesser, an organizer with Fossil Free Yale. She’s standing in front of a growing crowd of protesters in front of the building. 5 p.m. is approaching, and word is that the 48 activists involved in the sit-in will be arrested if they do not leave when the office closes-the demonstrators on the inside are communicating with organizers outside the via text message. 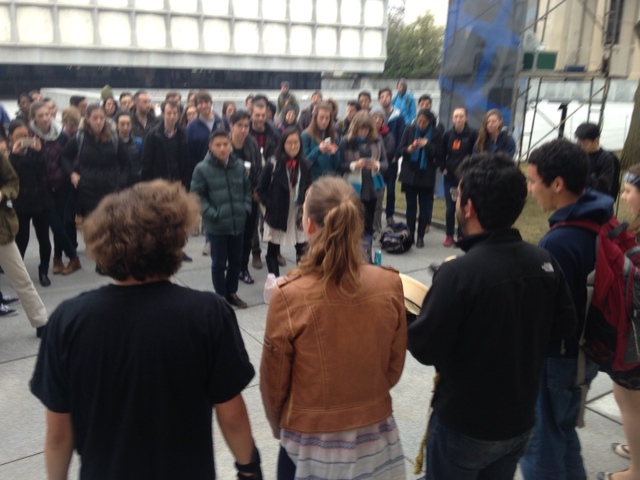 They say that they intend to stay put until Salovey makes a public statement committing to Yale’s divestment from fossil fuel. 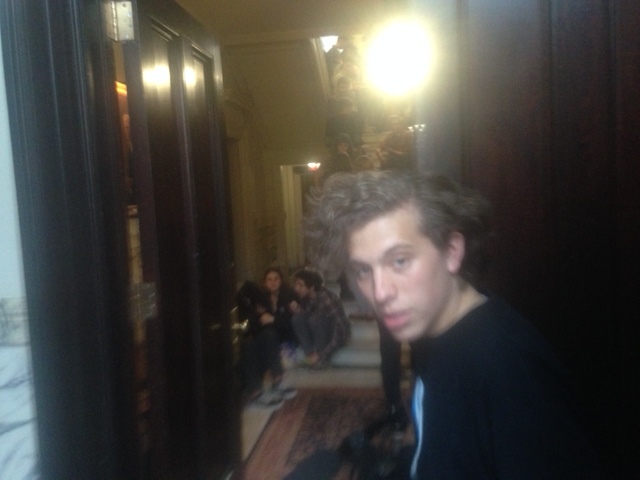 Just inside the building’s front doorway-where the tail end of a row of students could be seen sitting along the sides of the steps leading up to Salovey’s office- a Yale security guard was barring anyone else from entering. Sebi Medina-Tayac, one of the activists, was standing just behind him. Before the guard shut the door, we exchanged numbers and scheduled a mid-sit-in phone interview for less than 10 seconds later. “We see this as a way to continue engagement with the administration,” says Mya Jenkins, a Yale student activist who is inside the building-Medina-Tayac called me and handed her the phone. That engagement started in 2013, when proponents of fossil fuel divestment drafted a proposal for the university to do just that. The University would ultimately reject this proposal, but not before a good portion of the student population weighed in. A referendum on the issue was held in the fall of 2013, and 52 percent of the student body came out to vote. 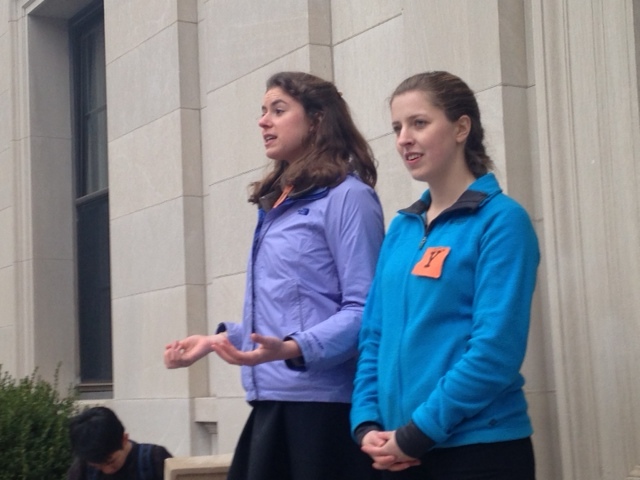 Of those who participated, 82 percent threw their support behind divestment. But the Yale Corporation has not made a move in this direction, choosing instead to pursue sustainability initiatives-including energy conservation and greenhouse gas reduction investment, on-campus renewable energy measures, and green innovation fellowships-that members of Fossil Free Yale say are not enough. Land rights and the potential impact on natural resources in the territories of indigenous communities such as First Nations in Canada-which saw protests against a massive natural gas pipeline project-are among the issues that come to mind. 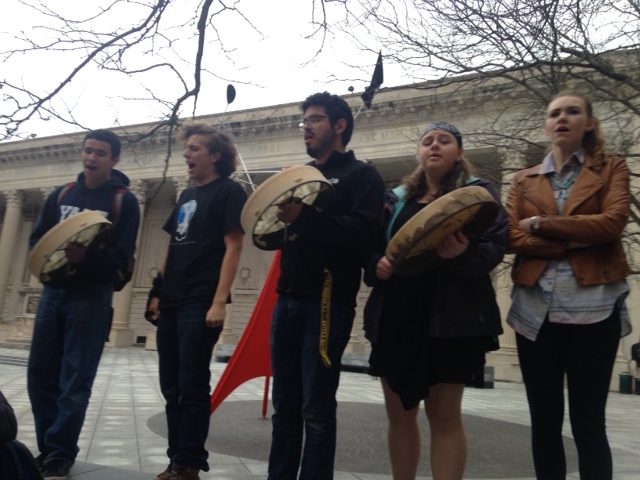 Members of the Blue Feather Drum Group, who came out in support of the sit-in as well, voiced their concerns in that regard. It’s 5:04 p.m., and word is that Yale security might be taking the sit-in demonstrators out the backdoor of the building to avoid the crowd that has gathered in front. No sooner is that suggestion made, and the group is racing around the left side to get to the rear exit-someone thought they saw activity there. So they wait-one half of the group is stationed at the main entrance, and the other stays in back. Soon they’ll cover all sides of the building-the activists formed a human chain surrounding its entire perimeter. By the time the sit-in demonstrators are about to come out, their supporters have learned that they won’t be leaving in handcuffs, but with a $92 trespassing ticket. Yale University Vice President and Secretary Kimberly Goff-Crews addressed the sit-in, advising students to take the issue to the student, faculty, alumni, and staff-composed Advisory Committee on Investor Responsibility (ACIR), according to University Spokesman Tom Conroy. The ACIR brings concerns to the Yale Corporation’s Corporation Committee on Investor Responsibility, Goff-Crews said. Either way, the push is not over, activists say. “Climate change is the biggest issue I will face in my life,” Lobel says. Sixty-seven percent of electricity-the EPA-reported largest source of greenhouse gases-is generated by fossil fuels, according to the Energy Information Administration. Transportation is the second leading cause, according to the EPA.